Field of Screams KY is a Haunted Attraction located in Brandenburg, KY. Team Zombillies reviewed this attraction on September 8, 2017. 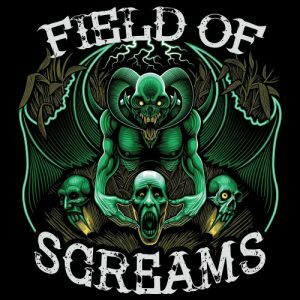 Field of Screams (FoS), located just southwest of Louisville, KY, is a massive outdoor haunt complex that features 5 different attractions: their namesake 6-acre corn field, a two-story barn, a haunted forest, the Hayride to Hell and Scream Tag. The Hayride and Scream Tag are secondary haunts that can be purchased separately from the main attraction, which involves the three other haunts running back-to-back (chronologically, The Field, then the Barn and, lastly, the Trail). FoS is one of the longest attractions we have ever been to; we were INSIDE their attractions (not including waiting in line) for over an hour! At $35.00 per person, the sheer magnitude of “haunt time” is very difficult to beat, so every haunt lover should pay them a visit at least once. Most of the actors we saw on the Hayride boarded the wagon seemingly effortlessly and made a quick pass around the group, looking for the scaredy cats, no doubt. A select few were very energetic and climbed up the sides like psychotic primates! Although this cast seemed to be pretty thin this year, the scenes had some distance between them and there were usually at least 1 or 2 actors at each. Among the most believable were the witch, the scarecrow and the rednecks, as they were very entertaining and interacted well with the group. The wolf in the Trail portion of the haunt had great vocals by realistically growling at us when we came through. The clown that was crawling on the ground on all fours was very unique, apologetically weaving his way through our group and asking, “Have you seen my saw?” There was also a clown in The Field who was very energetic. Without giving too much away, he did an excellent job of setting us up to look like the bad guys! The nun/school teacher lady was another very interactive one. However, one of the most unique characters we saw this year attacked us from under the water! Returning fans have likely seen him before and newbies that love slasher films should be in for quite a treat! With a haunt this big, you’re bound to see a little bit of everything… and that’s exactly what Field of Screams offers. It was difficult to see very much detail on the characters along the Hayride just because it was so dark out there. But, we did notice a realistic zombie with worn and tattered clothing, a masked scarecrow, the devil himself (who was sporting horns and lots of red skin) and a couple of clowns with bright-colored hair and matching attire… along with several other dark silhouettes. Field of Screams is pretty easy to find with their large, well-lit sign just off the highway and another sign at the entrance to the field/parking lot. If you’re using a GPS, you should have no issues at all. We followed their paved path to the large, grassy parking area where flaggers were stationed to direct everyone to their parking spots. The property is easy to navigate as well. Note that the only portable restrooms during our visit were in the parking lot, so be sure to make use of them because the line lengths here can be crazy sometimes. The ticket booth is one of the first buildings you’ll come to. It’s a larger one that you’ll have to walk by to get in line for the hayride and field (and there was a large line for it, as well). We did see a few clowns “interacting” with guests in line… revving up their saws and making sure everyone has been freshly ridden of all bodily fluids. A large stage neighbors the queue line for The Field and there was a live band playing music for the crowd to listen to. A lot of this haunt takes place outdoors, so you may want to wear boots or shoes that you don’t mind getting wet (if it has rained recently). There were also some tree roots and uneven ground along the way, so closed-toe footwear might be a good idea too. The Barn features a long ramp that leads you to the second floor and another passage that you have to crawl through. On the Hayride, we did encounter an extremely loud gunshot (scare attempt) that looked to only be about two feet away from the wagon (it made our ears ring for a while). There were staff members or characters at the entrance to each attraction (should you have any questions) and any that we talked to were very friendly and entertaining! We must admit, we were pretty darn excited as we approached the entrance to FoS! It’s been several years since our last trip here and not much has changed with the haunt’s curb appeal. But, in this case, that means there were a lot of loud noises, lights, gunshots, loud booms and screams coming from The Field as we gawked from afar! Heck, we could even smell popcorn before we got out of our car! The buildings, corn, barn and tractors helped make us feel like we were about to embark on a spooky adventure out in the middle of nowhere. Corn field-based haunts usually face the challenge of having to tear down and rebuild every year (because corn). With that understanding, there are a lot of cool scenes to enjoy throughout The Field and their crop is in good shape (about 10 feet tall in most spots)! In fact, they may have the most elaborately-decorated corn field we’ve visited to date. Naturally, they aren’t the most “permanent-looking” structures… but they’re detailed fairly well and pull off the looks they’re going for. Gunshots, shantys, blood, dismembered bodies, a kid-killing creature, creative paint jobs and more can be found along the way. The Barn is leaps and bounds above the rest of the complex when it comes to intensity. Appropriate sound effects, loud, hard rock music, various lighting effects and the overall scene designs are effective and have a lot more “energy” than most of the other areas here, yet they’re still what we would consider “old school.” The barn itself is interactive in multiple ways, so be prepared to get out of your comfort zone in this one! One of the first things we saw on the Trail was the huge, weathered house nestled just inside the woods. The towering facade, aged wood siding and overall rustic appearance made it downright creepy looking… especially with the eerie, blue light shining down on it from above! Most of the trail tends to follow this “backwoods” approach, but you’ll also find a labyrinth of barrels, a VERY effective vortex tunnel, a large graveyard and even a time machine that’ll drop you off in the 1980’s (yes, you read that correctly). The Hayride takes you on a journey across open fields and through a small, wooded area of the property. In the open areas, the scenes are spaced out pretty far and usually include small buildings, a few related props and the occasional (stationary) full-sized vehicle. But, keep an eye on your surroundings; not everything that’s out to get you will be coming from the ground! Other effects you may see are several saws, loud noises, flames and scenic lighting. On a side note, the Scream Tag attraction offers some amazing 3D artwork! Crafted by Stuartizm Designs (who specializes in extreme 3D airbrushing), each of the demonic depictions seemed to fly off the walls and the ones on the floor can throw you for a loop too. Dubstep music and accompanies the scenes to add more intensity and dimension. A single theme was not followed by the attractions at FOS. Instead, there was a huge variety of differently-themed areas… enough to get under just about anyone’s skin. From fairy tales, hillbillies, clowns, classic horror movie villains and many common phobias, it’s hard to tell what will be waiting for you around the next corner! On the Hayride multiple fright techniques were used against us. Multiple loud blasts seemed to succeed the most at making all of the riders jump, but there were also a few well-timed distractions that caught us off guard as well (which we don’t see very often on hayrides), so kudos for that! The tall corn in The Field blocks out the light from nearby scenes, which really kept us on edge during our trip… waiting for an actor to spring out from one of the dark crevices! But, despite the creepiness and potential for a lot of great hiding spots, we can’t ignore one prominent issue that hampered how scary the last 3/4 of the Field was on the night of our visit, and that was… group spacing. There are several chances to get turned around out in the corn maze. This can lead to meeting other groups which, granted, isn’t a big deal… normally. You can usually just wait around for a few seconds and get some distance between you again, that way the actors can be prepared when you get to their scenes, right? But, if you happen to run into a group that’s really scared and/or walking slow (like we did), then it doesn’t take long for a conga line to form as groups catch up to each other. In our case, several groups had converged for as far as we could see and the actors hadn’t quite ironed out their methods for keeping groups separated… again, probably because we visited them so early in the season. Unfortunately for us, the result was that we (and many other people) were left with very few surprises for most of our time in the corn. The groups’ screams in front of us indicated that there were still some good scares going on and, in the actors’ defense, most of them tried really hard to go for all of us multiple times. But, if their intimidating ways and pop scares aren’t enough to give you the heebie jeebies, then you may end up feeling a little bit disappointed… particularly if you enjoy the suspense build-up that you get when you’re walking up to a (seemingly) empty scene. We assume that this will improve as the season progresses and the actors become more familiar with scaring a lot of people. The Barn has a separate waiting line, which made the group spacing less of an issue. Also, the smaller scenes and more actors made the scares much less predictable and, as a result, more effective! The scares, by comparison, are much more intense in the Barn and, if keeping your group together sounds like a good idea, then hold on tightly to your friends (there’s a chance you may not walk out together)! We were paired with one other group and the scares seemed to be mainly directed towards the front of the line, but they were also coming from every direction, so each of us had our fair share of frights. Once – or “IF” – you leave the Barn, you’ll walk straight into the Trail portion of the haunt. Once we began, the dark paths, forest and dimly-lit buildings created quite an ominous setting. Along with some good timing, we saw some great hiding spots out there too! The zombie in the cemetery, the clown in the barrel area and Jason Voorhees are just a few of the most memorable. There are several different ticket options at FOS. General admission to the main attraction (The Field, Barn, Trail and Scream Tag) is priced at $25.00 per person. If you want to add a gun to your arsenal in Scream Tag so you can slay the monsters within, you can do so for an additional $5.00 per person. Tickets for just the Hayride to Hell OR Scream Tag can be purchased for $15.00 each, or you can just go all in and get a ticket for all attractions for $35.00 which is the route we took (you’ll still have to pay $5.00 extra for a gun in Scream Tag). That’s a total of 76 minutes! At the combo ticket price of $35.00 for all attractions, that brings this value to 2.17 MPD (minutes per dollar) which is quite a bit above the average of 1.5 that we see most often! If you are near the Louisville/Brandenburg, Kentucky area this Halloween season and are looking for a lengthy, fun and unique attraction, be sure to check this place out and see if you can find your way back out!